Huhuonline.com can disclose that the President Yar`dua handlers who hitherto stalled the transmission of a letter to the National Assembly over his medical leave, have ran out of time and options. Our checks reveal that the letter will be transmitted soon. According to a presidential source who elected anonymity ,” on Tuesday, the principal secretary to president, David Edevbri received instruction to come to Jeddah for the sole purpose of writing the letter, but as preparation was being made for him to proceed to Jeddah, a counter instruction came for him to tarry”. Continuing the source said “The leadership of the National Assembly, a section of the Nigeria media are on standby”. 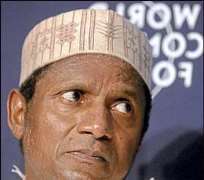 As Huhuonline.com previously reported, there is no end in sight to President Umaru Yar`adua`s hiatus. However, sources within King Faisal hospital, says that he now suffers from mutisim, (the condition of being unable to speak) and has been unable to communicate. It is uncertain if this condition is acute or chronic as at press time. Nevertheless, his continued absence has created a power vacuum and Nigeria is now a rudderless ship, sailing towards a constitutional crisis. Huhuonline.com understands the health condition of President Yar`dua has continued to dip; as he has become resistant to treatment, hence the President is not in a position to compose or write a letter to the National Assembly. Thus David Edevbie, who normally writes letter for the president will have to write and read the letter to his hearing. If he agrees to the content, it will now be taken that he wrote the letter himself, with his seal, said the source. Chief Mike Aondoakaa directed the VP to take over. Contrary to a media report that the attorney general, Mike Aondoakaa directed the Vice President Goodluck Jonathan to take over, Huhuonline.com can say there was no such directive. Sources told Huhuonline.com that it was actually the handiwork of the James Ibori, who is the arrowhead of the anti Goodluck Jonathan for acting president campaign. Huhuonline.com gathered that James Ibori was shocked, when he learnt about the directive asking David Edevbie to proceed to Jeddah to write the handover letter. Consequently, he sponsored the story of the purported handover to Goodluck Jonathan in his newspaper, Daily Independent. Like wild fire the story spread, even into reputable online media. According to British court records, Mr. Ibori, age 29 and standing at 5ft 11 at the time, was born on August 4, 1962, and lived at 9 Nower Hill Pinner Middlesex, England. He worked as a cashier at Wickes Building Supplies, Victoria Road, Ruislip, Middlesex, and earned 9,500 pounds per annum. On Tuesday, August 28, 1990, three days after she had been in police trouble, Theresa Nakanda went into the Wickes Building Supplies Store and, putting her Uxbridge Police Station incident quickly behind her and stole goods with the connivance of her boyfriend, Mr. Ibori, at about 8.30pm. Mr. Ibori "Assisted his girlfriend (Theresa) to pass through his check-out without paying for goods whilst employed as cashier," was the way British court records described the former governor's act. Mr. Ibori and his girlfriend (now wife) were then charged before the Crown court at Isleworth. Theresa Nakanda and James Ibori, on August 28, 1990, were charged for "stealing a quantity of goods..."
On January 25 1991, Judge Thomas convicted both Mr. Ibori and his wife and fined them "300 pounds in default and 14 days imprisonment”. They were also made to pay "costs of the prosecution in the sum of 450 pounds." Mr. Ibori, who was represented by the law firm of Desmond Wright and Co., paid a total of 750 pounds for his crime. A year after his conviction before the Crown court at Isleworth, Mr. Ibori, who is an elder of the ruling Peoples Democratic Party (PDP) was back in court again, this time at the Clerkenwell magistrates court, in London. "I have made further enquiries into the criminal convictions for Mr. James Ibori and can confirm that on the 7th of February 1992 at Clerkenwell magistrate's court, London, Mr. Ibori was convicted of one count of handling stolen goods contrary to Section 22 of the Theft Act, 1968." The offense took place on Thursday, September 12, 1991. Putting on a blue suit and a pair of brown shoes at about 3:50pm, Mr. Ibori was challenged by British police officer Michelsen who found an American Express Gold card on him. When he was challenged, "he claimed to be Sean Burns, the card owner", the UK court records show. By the time the card was retrieved from Mr. Ibori, the "card was involved in 1000 pounds of misuse." Mr. Ibori was arrested but granted bail. The former Delta State governor was charged before Clerkenwell Magistrate Court in England on two offences, one of which stated that "on or before 12th September 1991 within the jurisdiction of the Central Criminal Court, you stole one American Express Gold Card of nominal value belonging to American Express, contrary to: S1 Theft Act 1968." The court could not prove that he stole the card; however, Mr. Ibori was convicted of handling stolen goods. "You did handle one American Express Gold card in that knowing or believing it to be stolen goods; you did dishonestly arrange to receive the said goods. Contrary to S22 (1) Theft Act 1968," the court ruled.